At Back to Health Wellness Centre we encourage patients to “Get Their Heads Examined” by one of our practitioners if they experience headaches, migraines, TMJ, or have had a concussion. Did you know that 80% of headaches are neck related and that 9 out of 10 Canadian Suffer from headaches? What do you do when you suffer from a pounding headache or migraine? Do you grit your teeth and carry on? Lie down? Pop a pill and hope the pain goes away? There is a better alternative. Headaches and migraines are common pain events for many people, and they are often recurring. A variety of prescription and over-the-counter medications may control headache and migraine pain, but they only mask the pain without addressing the cause. These medications may also have side effects, especially with long-term use. Hoping to find a more natural and holistic solution to chronic headaches, many people turn to chiropractic. Did you know that 8 out of 10 headaches/migraines are neck, TMJ (jaw joint) and skull are related. Chiropractic can play an important role in treating migraines and headaches. Clinical studies suggest that chiropractic may have a measurable role in the prevention of migraines and headaches. Through adjustments of the spine, neck, jaw and skull: migraines and headaches can often be reduced or prevented. Nerves control vascular system tension, and chiropractic adjustments reduce irritation of the nervous system beginning with its roots in the spine, also improving vascular flow. Book your chiropractic appointment with Dr. Barbara Rodwin today! It is advised to have a biomechanical exam to determine the cause of your headaches or migraines. After this exam, Dr. Barbara Rodwin will often adjust these regions. Recommendations such as massage, food testing, supplements, changes to sleeping positions, proper pillows, ergonomic changes, mouth guards, x-rays, neurological consult, stretching and strengthening the involved areas, may also be suggested. Headaches or migraines are often caused by many factors combined and these all need to be addressed to help resolve the issues. HEADACHES AND MIGRAINES ARE MULTI-FACTORIAL. THEY CAN ORIGINATE IN THE JAW, FACE, NECK AND SHOULDERS. Dr. Barbara Rodwin (Doctor of Chiropractic) or our Doctor of Naturopathic will determine from nutritional analysis if nutritional supplements are required to aid a patient in alleviating their headaches &/or migraines. Some of the nutritional supplements that Dr. Rodwin may suggest are: magnesium, fish oil, coenzyme Q10, melatonin, Vitamins B, C, D, and E. A Daily Food Analysis is completed to determine the deficiencies. Also, foods can trigger headaches and migraines. Dr. Rodwin may suggest you consult our naturopathic doctor for further testing for this. Naturopathic Doctors recognize that headaches and migraines are the result of other disturbances within the body; hence treatments with pain-relief medications often just act to suppress a much deeper, underlying trigger. Naturopathic care aims to treat this underlying trigger. Changes in circulation and the micro-vessels of the cranium can lead to swelling or vasodilation of these blood vessels and an increase in pressure. This can be triggered through tension (psychological or muscular), histamine release (through allergenic triggers including food or environmental sensitivities) and increases in inflammation or platelet clumping. For more information and to take a deeper look at what’s triggering your headaches or migraines, talk to our Naturopathic Doctor. You can book a complimentary 15 minute appointment with our naturopath to discuss your headache/migraine and other health issues to see if she can aid you! Concussions are now taken more seriously than ever in both professional and amateur sports as well amongst the general public. Improved awareness of concussion symptoms and emphasis on their significance has led to improved treatment outcomes for patients. 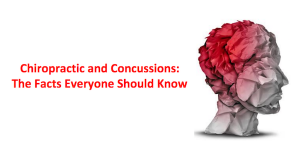 It is important to understand that a concussion is when the brain violently strikes the inside of the skull resulting in very simplistic terms, a bruise. This can happen from either a direct blow to the head, or it can happen from a small to large movement of the head & neck with minimal or no contact as would be the case in a whiplash injury. The swelling of the brain tissue, which happens when any type of tissue is bruised, is what causes all the unfavorable symptoms associated with a concussion. However, symptoms may be severe and linger for extended periods. Symptoms are widely varied and may include headache, memory loss, vomiting, nausea, dizziness, ringing of the ears, blurred vision and other symptoms. Emotional and mood changes are common as well as an inability to concentrate. Loss of memory or consciousness is not necessarily a component of even serious concussions. Early diagnosis is important because removal from activity is critical in reducing symptom duration and reoccurrence. If you or your child has suffered one or more concussions, regular chiropractic adjustments can be a huge benefit to you & will complement any medical treatments you may be having. Chiropractors receive extensive training in the recognition of concussion due to the high incidence of this injury amongst chiropractic patients. An often overlooked component of concussion treatment is the neck injuries that frequently accompany the concussion. The most important thing to remember about concussions is that early diagnosis is critical. Please book an appointment for an assessment with Dr. Barbara Rodwin if you have suffered a concussion. 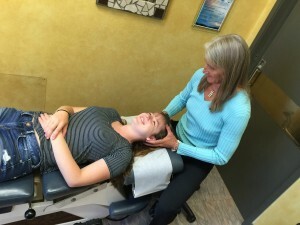 Dr. Barbara Rodwin also practices a technique that works exceptionally well for concussions, the CATS (cranial) technique. Petadolex is very important as a supplement for concussion problems. When taken with a combination of other supplements Petadolex allows for a quicker recovery process! Ask your chiropractor or naturopath about this. Cranial adjusting speeds recovery from concussions! C.A.T.S. is a breakthrough technique for correcting the misalignments in the skull caused from the trauma involved in concussions. Cranial Adjusting Turner Style (C.A.T.S.) can realign the bones and restore the proper circulation of cerebral spinal fluid and blood to the nerves and tissues damaged by misaligned bones. This treatment has enabled many concussion sufferers get back their lives and do it more quickly than the traditional treatment protocols. C.A.T.S practitioners are able to detect and correct any cranial misalignments. They function under the basic principle that if a cranial bone is out of place; put it back into place and restore its function. Cranial adjusting provides faster and better recovery for concussions! Post-concussion symptoms can remain long after the original trauma. Headaches persist, brain fog does not lift and disorientation can completely take over every aspect of a person’s life. Modern advances in brain research and imaging have proven that the sutures to the bones in the skull contain blood vessels, nerves and connective tissue, all within a space 1/100th of an inch across. They help nourish the cranium and facilitate movement of the bones that form the skull. The impact of a concussion can knock bones out of alignment and cut off the circulation within these sutures. Because the skull bones are still misaligned from the trauma, it’s difficult for normal brain function to be restored. Dr. Barbara Rodwin is certified in the C.A.T.S. technique. Please feel free to ask her questions regarding this technique. As previously mentioned, a concussion is a bruise. As with all bruises they take time to heal and repair. The nutrients required to help heal a bruise are delivered via the circulatory system. It is essential to increase flow to these afflicted areas without increasing blood pressure. Massages are a great solution. They de-stress your body, lowering your blood pressure while increasing circulation. The relaxing effect of massage helps the body produce endorphins, which causes the body to naturally have the sense of relaxation. This stops the swelling and thereby decreasing the intracranial pressure. Patients with concussion and Post -Concussion Syndrome need to be treated to assist healing of the neurological, vascular and autonomic components of these injuries. Cranio-sacral therapy (CST) is one approach that may be applied by experienced therapists to facilitate this process. CST is a gentle, hands-on method of evaluating and enhancing the functioning of a physiological body system called the craniosacral system – comprised of the membranes and cerebrospinal fluid that surround and protect the brain and spinal cord. Please speak to one of our registered massage therapists for more information on and/or treatment of a concussion.